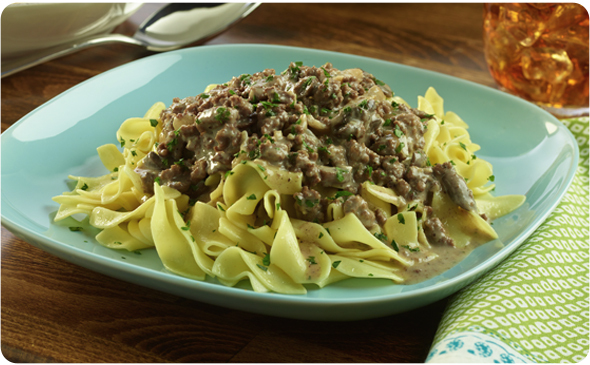 Try this dish with Better Than Bouillon® Premium Mushroom Base; also try with Better Than Bouillon® Premium or Reduced Sodium Roasted Beef Base. Try this this dish with Spatzle in place of the egg noodles. Add the ground beef to a large saucepan over medium high heat. Using a wooden spoon break up the ground beef and cook for 5 - 6 minutes. Carefully drain the grease and continue to cook for 2 - 3 minutes more. Add the onion and mushrooms to the pan and cook for 4 - 5 minutes, stirring occasionally. Add the garlic and Mushroom Base to the pan and cook for 30 seconds more. Add the red wine, pepper, ground mustard, and salt to the pan, turn up the heat and reduce by half, 3 - 4 minutes. Add the water with the Organic Roasted Beef Base, bring to a boil, reduce heat and simmer for 3 - 4 minutes. Whisk together the heavy cream and flour in a small bowl. Slowly add the mixture to the pan, stirring continuously to avoid lumps. Simmer for 2 - 3 minutes. Remove the pan from the heat and serve immediately over the noodles.